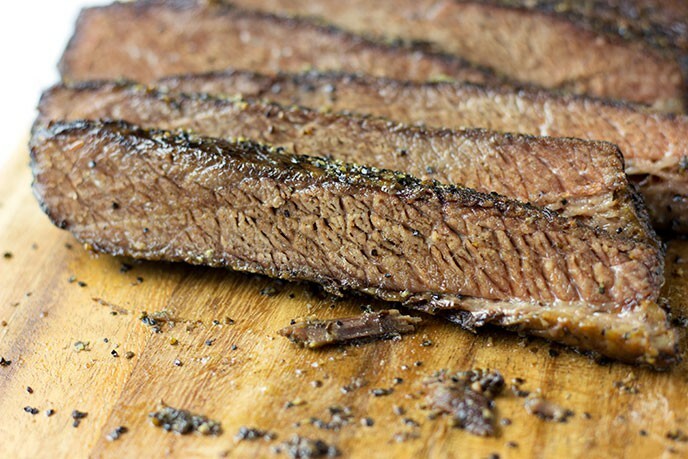 Cooking a perfect smoked beef brisket is both challenging and rewarding. You have to get the smoker at the right temperature, smoke the meat for the perfect amount of time, and add a rub that enhances the meat’s flavor. It’s not overly difficult but it does require patience and tenacity. Okay. I’ll confess. The first beef brisket I tried to smoke ended up being a disaster. I overheated the smoker and didn’t watch the meat temperature carefully enough. It was a hard, tough meat disaster that I try not to think about. Fortunately I have learned a lot since that initial disaster. 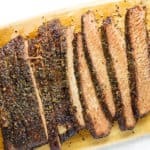 With some trial and a few more errors, I’ve developed a simple recipe that creates a mound of juicy smoked brisket that everyone seems to love. 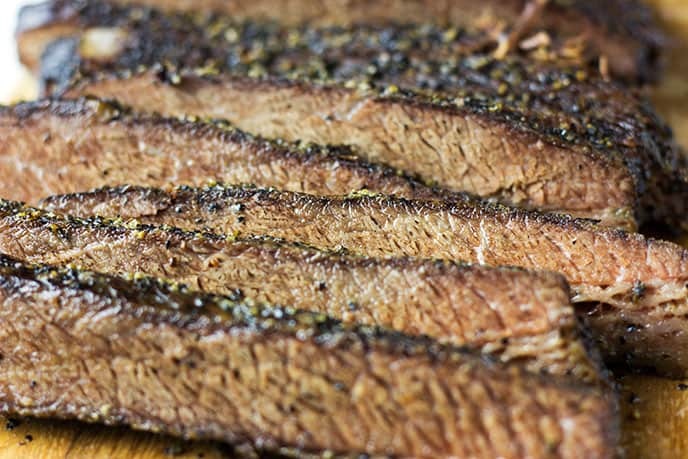 At least three or four times each summer, I’ll get the smoker heated up, bring out the brisket, and let it cook until it’s mouth-watering delicious. 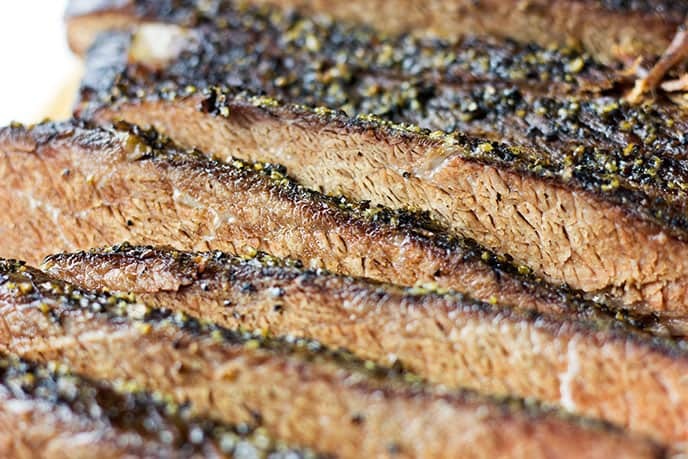 Brisket is actually one of the tougher cuts of beef. In most occasions, I will smoke chicken breast or chicken thighs as they are easier to smoke. That’s why cooking beef low and slow is critical for creating a tender, flavorful piece of beef. Three of the more common ways of cooking brisket is smoking, slow roasting in the oven, or in a slow cooker. It can also be cooked on a grill, but needs to be kept off direct heat and cooked at lower temperatures for longer. Searing brisket is essential if you are not smoking the meat. This helps it retain its juices and gives the final dish better color and depth of flavor. An easy sear method is to heat a cast iron skillet to medium high, then cook the meat on either side for three to five minutes. A good cut of brisket should have a good layer of fat on one side. The fat helps flavor and tenderize the meat as it cooks. Don’t remove the fat layer when preparing the brisket. If a recipe calls for its removal, find another recipe. As with any other cut of beef, cooking a brisket without any seasoning is not recommended. 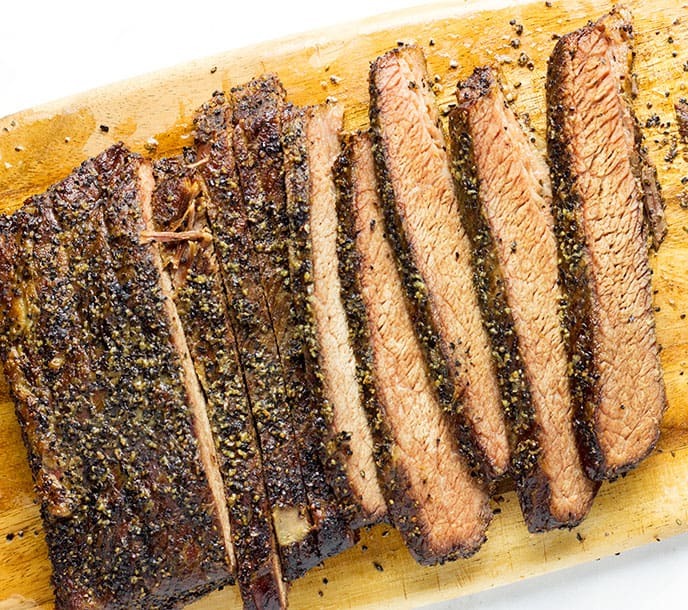 In fact, brisket tastes fantastic with almost any seasoning you put on it. This recipe includes the most basic of rubs: salt and pepper. But, the sky is the limit when it comes to the spices you use on a brisket, especially if you are smoking it. Think onion and garlic powder. Go with something a bit spicy like cayenne or a cajun mix. Go sweet with some maple syrup and brown sugar. Let’s start with the meat. Try to go for a bigger size beef brisket such as 8 pounds or larger. Smaller size tends to dry out the meat quickly when smoking. The bigger the better. Don’t forget to wrap the brisket after about 4 hours. I used butcher’s paper to wrap the meat, but you can also use aluminum foil. Wrapping keeps the meat tender and juicy. Also, you’ll only need to add wood chips in the first 4 hours of smoking. Once it is wrapped, adding wood chips is no longer needed. Finally, you will want to pair this tender and juicy smoked beef brisket with your favorite bbq sauce. Mix the kosher salt and black pepper in a shallow bowl. Shake a generous amount of the salt and pepper rub onto the meat. Pat the rub into the surface and make sure every part of the brisket is covered. Preheat the smoker to 225F and add wood chips. I used oak wood for this recipe. Place the meat inside the smoker with the fat side facing up. This will baste the meat in the fat's juices. Smoke the meat for 4 hours. The internal temperature of the brisket should be 165F before removing it. Once the meat is at 165F, remove it from the smoker. Wrap the brisket tightly in butcher's paper to keep the juices in. Return the brisket to the smoker for another four hours or until the meat's internal temperature reaches 205F. Remove the brisket from the smoker. Let it rest at least 30 minutes before slicing. This allows the meat to retain its juiciness.